The Clinical Research Coordinator or CRC is a specialized research professional working with but under the direction of the clinical Principal Investigator. Though the Principal Investigator is mainly responsible for the overall design, conduct, and management of the clinical trial, the CRC supports, ease and coordinates the daily clinical trial activities and plays a critical role in the conduct of the study. By performing these tasks, the CRC works with the principal investigator(PI), sponsor and institutions to support and guide them on the administration of the financial, personnel and other relevant aspects of the clinical study. The CRC reports to the PI. The majority of these professionals has a bachelor's degree in their field, although some earns their Master's degree. Research coordinators mainly work in clinical research facilities. The workplace has a team ambiance, with clinical research coordinators working closely with a team of clinical research associates they are responsible for supervising. CRC also work closely with the principal investigator of their research facility to ensure that the trial follows every ethical guidelines. Clinical Research Coordinators recruit and screen patients for trials, ensuring that the study adheres to safety and government regulations, monitoring patients and reporting study results. Clinical research coordinators might also be responsible for obtaining grants to fund the study. Though the U.S. Bureau of Labor Statistics does not maintain records for clinical research coordinators, it did report that there is an employment growth between the years 2012 and 2022 for clinical laboratory technologists and expected to be 14% while growth for clinical laboratory technicians are expected to be a significantly higher 30%. Due to the medical nature of the job, clinical knowledge with experience is important for future clinical research coordinators. Individuals might choose from a variety of training or degree programs to enter the clinical research field. An undergraduate degree program in clinical research, e.g. an Associate in Applied Science in Clinical Research Coordination or Bachelor of Science in Clinical Research, can help individuals meet the required eligibility criteria for an entry-level clinical research position. These degree programs typically include coursework in biological science, medical terminology, case studies, clinical monitoring and ethics. Master's degree programs, like the Master of Science in Clinical Research and Regulatory Administration, can help prepare for higher positions through coursework in leadership, research conduct and clinical trial recruitments. People who already has a degree in a clinical field, such as nursing, might want to pursue a certificate or diploma in clinical research. These programs typically focus on the specific tasks required of clinical research coordinators. Students might be expected to have previous knowledge of clinical subjects, such as patient monitoring and medical terminology. 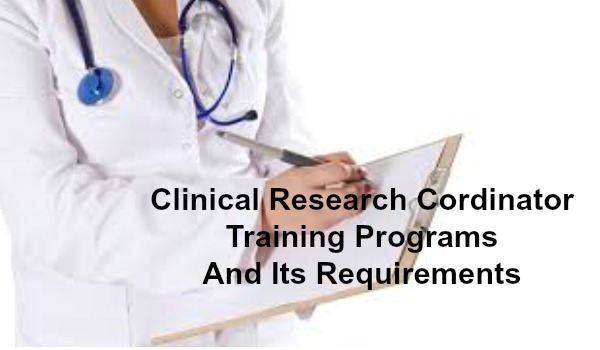 The Association of Clinical Research Professionals (ACRP) gives voluntary Clinical Research Coordinator (CRC) certification for individuals with at least two years of experience in clinical research or a closely related field . The educational requirements though vary with the candidate's quality and quantity of work experience. Eligible candidates should submit proof of education and work experience, pay an exam fee and need to pass an exam in order to receive the CRC certification. CRB Tech Solutions is a leading health care clinical research training institute and offer best in class job oriented clinical courses to help launch your career. Clinical Research review of CRB Solutions is sufficient to make you consider and take up a career in this field.